Today I completed my spiral of inquiry for Term 1. "Teaching as inquiry, a process that encourages you to change your practice in order to enhance success for students" ... "is likely to be highly useful for teachers as they respond to the need to develop digital fluency across diverse learner groups and capabilities. " (source). Spiral of inquiries are designed to push students, in a short period of time to the next level of learning, hence causing accelerating learning rather than learning at the rate of their peers. This is a way for them to 'catch up' to their peers in a short time, rather than being constantly behind. My spiral focuses on my lower-achieving maths students, who sit just below the national standard for maths. In my spiral document, I discuss what these students can currently do, what they should be able to do to be 'at' the national standard, what I think has contributed to them being behind, and what I am going to do in an attempt to accelerate their learning. How can the use of materials help to build deep understandings of mathematical concepts? This week, although it being only the 2nd week of the year, I went full steam ahead with my maths and reading programmes. 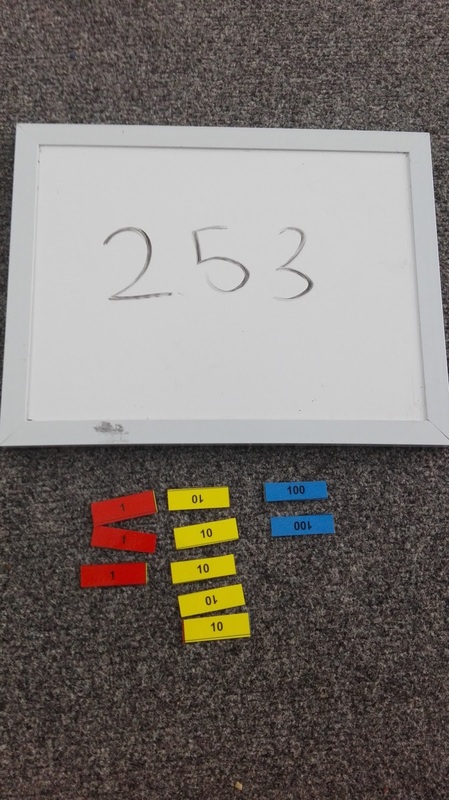 I chose to focus on place value, as this is a building block most students are missing which causes them problems later on in maths. I knew that these students get stumped when they are dealing with numbers in the 100's, and had never dealt with anything in the 1000's before. 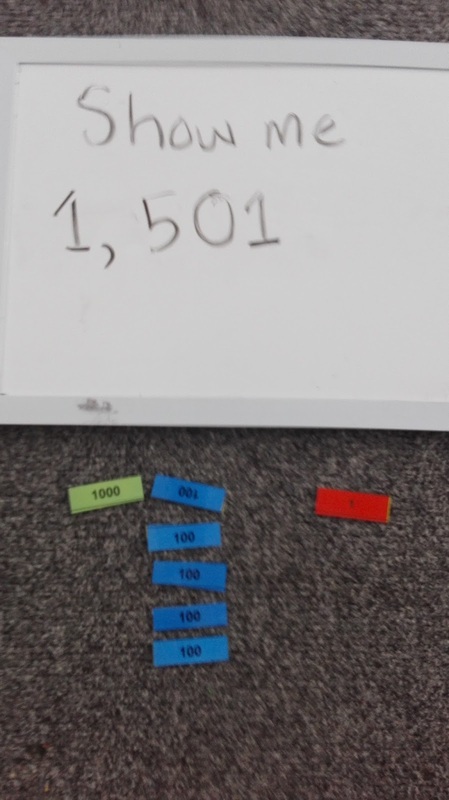 This showed me that they had some gaps missing in their place value knowledge. 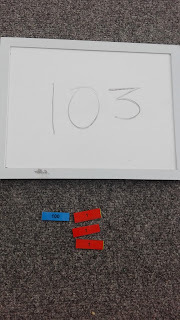 On Tuesday and Wednesday, I used popsicle sticks with my whole class so I could judge their place value concepts. I would say 'show me 23', and the response I was hoping for, was 2 lots of 10 popsicle sticks, tied together with rubber bands, and 3 popsicle sticks by themselves. However, I got everything but that. Even my year 6 students didn't do this. 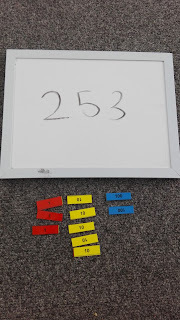 They counted out 23 and showed me them scrunched up in one hand, or made the shape of the letter 23 with the popsicle sticks as their pen (if that makes sense?). Some remembered that they were supposed to tie something together, so they tied the 2 lots of 10, together, in one big pile, and left the 3 ones by themselves. I modelled what I wanted them to show me, and explained why. Some of them just couldn't understand why I said only bundles of 10 were allowed to have a rubber band around them. There was definitely a gap in the students knowledge of exchanging numbers (i.e. ten one's is the same as one ten). We started to process through this bundles and rubber bands business, when I tripped them up again. Instead of 'show me X number', I asked them to 'show me X number, then add/minus X number'. These questions were designed to force students to exchange - opening up 1 lot of 10 to take out some ones, adding ones then exchanging them for a 10, etc. What I liked about how I ran this activity was that after a few of this new type of question, I then asked students to buddy up. The pair, together, would do the 'show me X number' part. 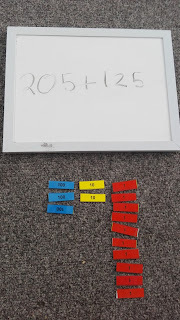 Then, student A from each pair would come to me and I would whisper the 'add/minus X number' part, which they then had to go back and EXPLAIN to student B - not tell them. 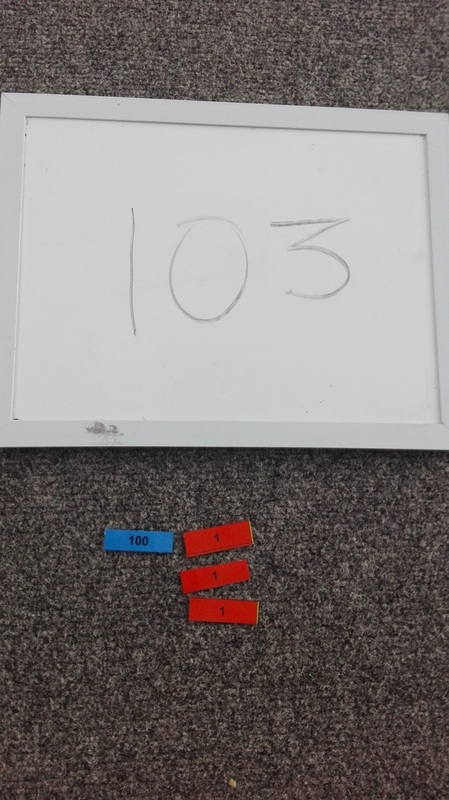 For example, if the question was 128+13, they were not allowed to say 'plus 13', they would say 'add 3 ones, then change 10 ones for 1 ten', explaining the process step by step. 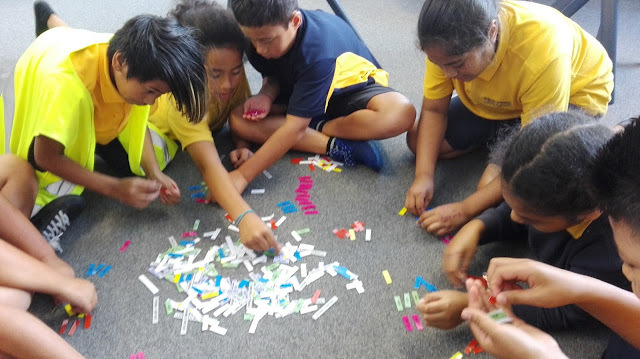 This showed me a deeper level of understanding then just 'show me X number', because I could judge student A's understanding of the process of exchanging, and student B's understanding of mathematical language, at the same time. Of course we swapped, did a bunch of varying questions that all were showing the same thing although they kids didn't realise that lol. 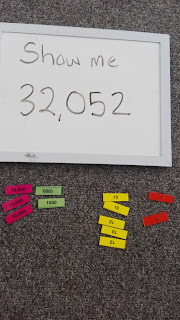 It was a great way for me to judge the whole classes understanding of place value (and maths language) at the same time. 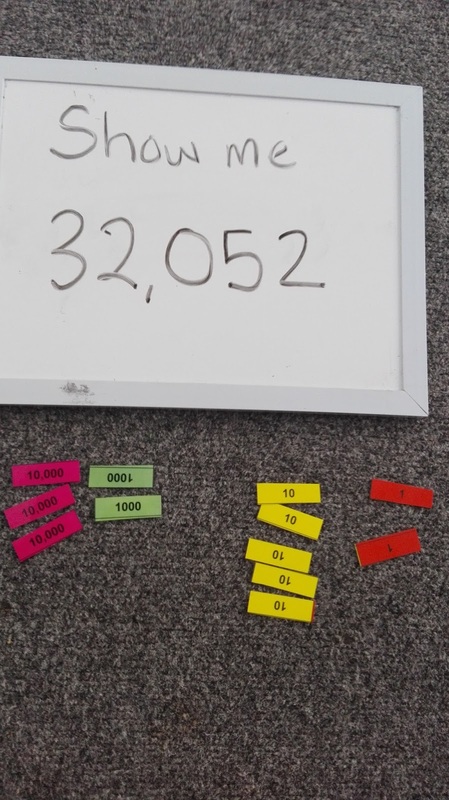 On Thursday and Friday, I introduced place value counters I made. 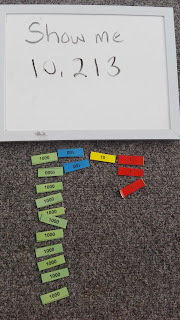 I made these on Wednesday, because I knew there was no way I could use popsicle sticks to show place value into the 100's and 1000's, I literally just don't have enough - and can you imagine the mess?? The kids LOVED them straight away. I did the same thing to begin with - 'show me X number'. 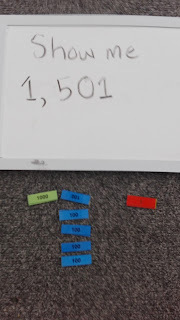 Instantly I found misconceptions about their place value knowledge. The first misconception we addressed was this. Yes, they do have the right number of the right value. It does add up to 253. But look at the order they have put it in - they have put ones on the left and 100's on the right. To me, this meant they didn't know, or had forgotten the actual value of those numbers and where they sit when you write and read the number. Once we had addressed this misconception once or twice, going through a full explanation about why, I would only prompt with 'is that the order you would write this number in? ', and they would click and fix their mistake. The second misconception I found was kids doing this. Again, they have got the the right number of the right values, but they have not used a place holder zero. See how there is no space in between the 100 and the 1's? This showed me they didn't know why the zero was there, what purpose it served, and why having it made a difference to the number. None of them had ever heard the term 'place holder zero', and when I explained the yes, there are no tens, you are right, but we need to keep the space there otherwise the other numbers might fall into the wrong 'place value house', and that you had to put a zero there to keep the other numbers in the right place, they kind of got it. Before introducing the next 'big number', I did a few add/sub questions to see if they could exchange. What is happening in this photo sadly happened quite a bit.. Instead of realising 5+5=10, so I exchange the 10x1 and put in 1x10, they would leave the 10x1. The same thing happened in other values - again, not exchanging for the next big number when there are 10 of the same value. For the students in my spiral of inquiry, they tripped up a little when we got to the 1000's. Their inexperience with larger numbers definitely showed. 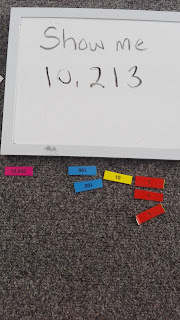 Using the place value counters played a huge role in helping them understand where thousands went, and understanding that it is a number the same as the 1's, 10's and 100's, just bigger. It's not scary. 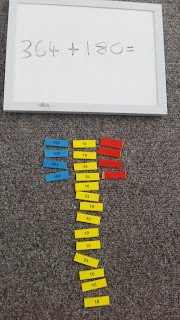 Every time I asked them to 'show me X number', I always wrote it out and showed them, so they could use the order of the written number to help them process what went where and how many of each. It was definitely helpful. They got a bit more confident, then began doing this. Yes, they have the right number, it does add up to 10,213. But you don't actually put 10 into the thousands column, you put 0 there and 1 into the 10,000's column. Their inexperience with large numbers definitely caused this error, as I don't think they even knew or realised there was anything bigger than 1000's. I introduced the next 'big number', 10,000. There were a few gasps, literal gasps, that there were number bigger than 10,000. This was blowing their mind. I did this one for them, to show them that I exchanged 10x1,000 for 1x10,000. We had to stop and talk about exchanging again here, as the big numbers kind of scared them and they forgot that you ALWAYS exchange in 10's and 1's. 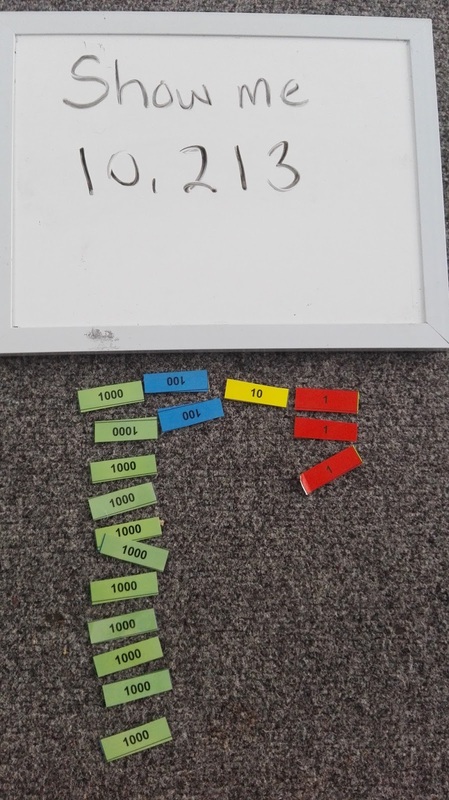 The students getting more and more confident using the 10,000 numbers. We stayed around this point for a while, doing add/sub questions so they could practice their exchanges in large numbers. For example, with 32,052 I would say -10,831 so they had to exchange a 1,000 back to hundreds, at the same time taking away 1 lot of 1,000. This took some time to get right. 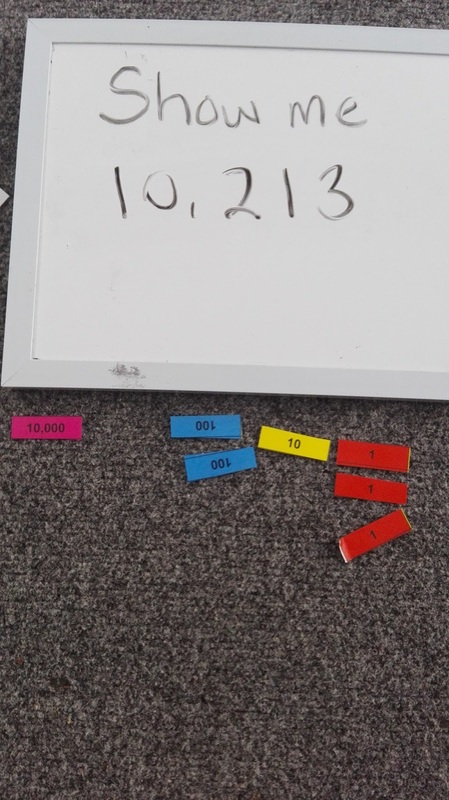 It was a great first week of maths - I learnt A LOT about my whole classes place value knowledge, and was able to introduce big numbers, and new concepts such as the place holder zero, and demonstrate old concepts, such as exchanging 10x1 (etc), thanks to the materials I was using. For my spiral of inquiry group, I think they responded really well to using materials every single day, (rather than as a sometimes thing), a few even asking to do more because it was fun. 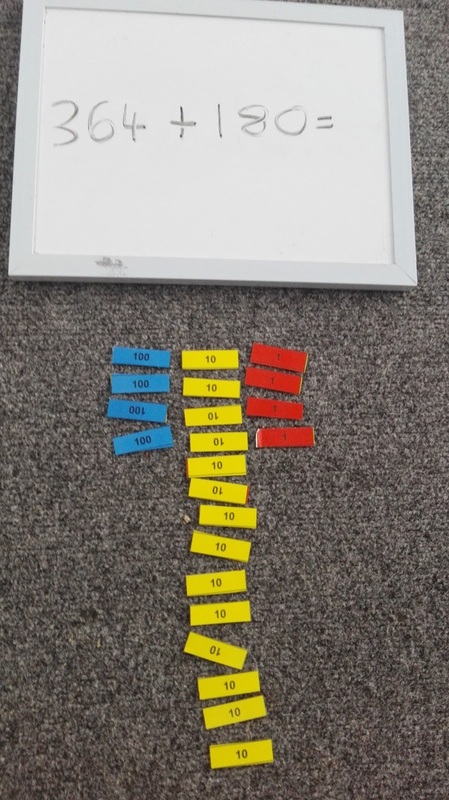 Although I do not think they will remember everything from this week going into next week, using the materials will help them remember quicker, have a deeper understanding of it, and contribute towards a positive attitude and growth mindset in maths (oh yeah, I can do maths! I am smart!). I will keep using materials as part of my maths inquiry and documenting the outcomes on my blog.